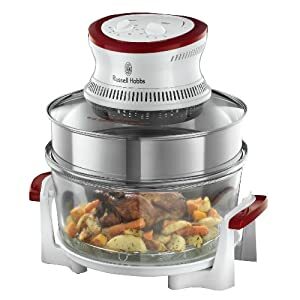 The Russell Hobbs 18537 Halogen Oven cooks food faster and is cleaner than a regular oven. It is versatile and is perfect for roasting, baking, grilling and even defrosting. In our opinion food tastes better when cooked in this oven! The Russell Hobbs Halogen Oven cuts down the cooking time and is especially useful when you're using it in conjunction with your normal oven. The oven is fitted with a timer and has a clear glass body which allows you to see your food while it cooks, meaning you don't lose heat by constantly checking to see if the food is ready. It's well built, and with care will last many for many years to come. The oven can be put away easily, and is easy to clean, and takes up little space and would work perfectly in a mobile home or caravan. Some people might be reluctant to go for a halogen oven, or may or may just think it is a gimmick. But this would be a shame as this oven meets all expectations and does what it says on the box, with minimum fuss, it is a fraction of the cost of a conventional oven and cheaper to run. The only negative is the lack of information with timings and settings for different foods and baking you might be left guessing and having to experiment but its quick and easy to get the hang of this oven. All in all The Russel Hobbs Halogen Oven is an excellent purchase and you may never go back to a normal oven again!